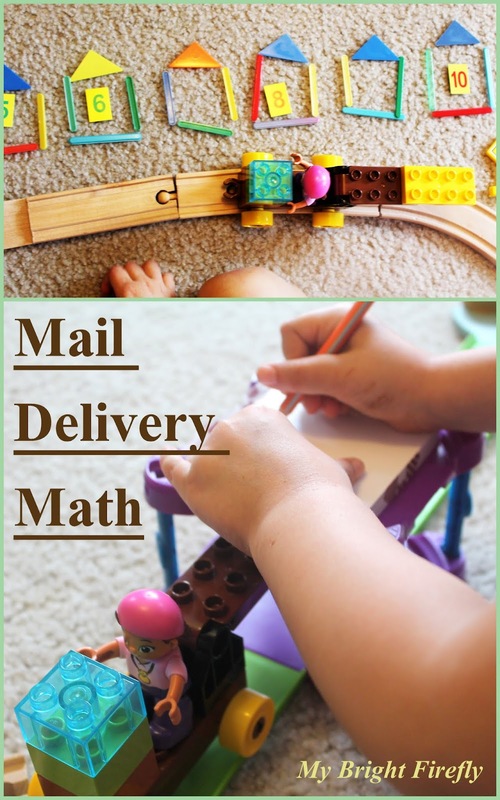 This fun quick set up using supplies at hand turned out awesome for engineering a mail delivery services and playing with math. Some activities included: building and playing with a number line, practicing writing numbers, counting up and down, squares and triangles, learning manners. Challenge: we have these sticks we can use to build houses. What are the shapes used in your houses? Challenge: how would a mail carrier find the correct house to deliver toys and flowers to? (Possible answer: A mail carrier would need an address.) Can you make addresses for these houses using this number cards? The strong wind blew through the neighborhood (showing the wind with hands while picking up a couple of numbers, or mixing them up). Oh, no! What happened? The mail carrier will not be able to deliver mail! Can we fix it? We set up a little post office at the end of the drive way. Supplies used: paper and a pencil, toys to be delivered, a truck designed to carry a driver, a package, and a piece of paper. Math challenges: writing down numbers, counting up and down the number line when delivering mail. After mail delivery set up was cleaned up, My Firefly wanted to draw a picture of the pretend neighborhood. color the roof of the house that is in between the second and the forth houses purple. As someone might notice, we are falling in love with challenges here. The next ones planned (hopefully) is Banana Math.